A return to hard-liners' heaven? While Seoul, Tokyo or Beijing had been impatient to see any sign or hint of Kim Jong Un’s goodwill, U.S. President Donald Trump on May 8 finally announced that “the U.S. will withdraw from the Iran nuclear deal.” To me, it sounds like another eerie feeling of deja vu about Washington, Jerusalem and Tehran. This Iran nuclear deal, in fact, is one of the few issues on which I do not disagree with Trump. 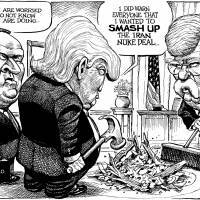 The deal, officially called the Joint Comprehensive Plan of Action(JCPOA) and concluded by the United Nations Security Council’s permanent member states, Germany and Iran, was indeed “defective at its core” as Trump stated officially. I cannot agree more. Trump said the JCPOA “allowed Iran to continue enriching uranium and, over time, reach the brink of a nuclear breakout” and “lifted crippling economic sanctions on Iran in exchange for very weak limits on the regime’s nuclear activity, and no limits at all on its other malign behavior” in the Middle East. Having said that, I don’t support Trump’s decision to withdraw from the JCPOA. 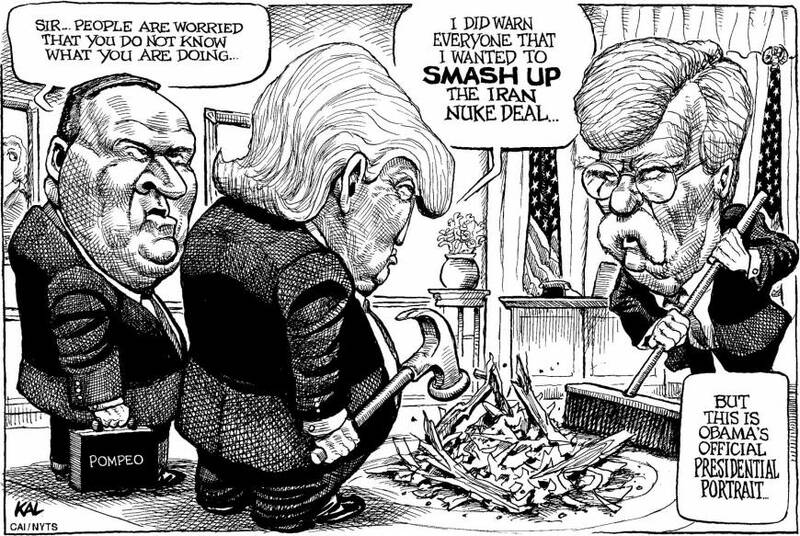 In diplomacy, agreements are the products of long and bitter negotiations at least with minimum goodwill and mutual trust. No matter how defective the JCPOA may be, what is more important is the legal stability of the international order. In his announcement, Trump also stated that Iran will “want to make a new and lasting deal.” Does he really believe that he can renegotiate? Trump seemed so naive that he underestimated how malevolently determined the Islamic Revolutionary Guard Corps or other Iranian hard-liners can be. There is a good personal reason for the sense of deja vu that I mentioned earlier. It was in July 1996 when I became director of the Second Middle East Division in Japan’s Foreign Ministry. The office covers 10 nations, namely Iran, Iraq, six Gulf Cooperation Council (GCC) states, Yemen and Afghanistan — a most politically sensitive part of the world. One year later, Mohammad Khatami, a reformist theologian, was elected the fifth president of the Islamic Republic of Iran. Unlike his opponents, his platform was liberalization and reform. Khatami advocated freedom of expression, tolerance and civil society, constructive external relations, a free market and foreign investment. I was surprised but also thrilled. When Khatami started implementing his new policies, I flew to Iran to see how things had changed in Tehran. I went to the main downtown marketplace and saw a group of young ladies. Of course, all were in chador except one who did not hide her beautiful long hair, which was only partially covered by a scarf. I was lucky that she was standing beside me and I could talk to her. She worked at a travel agency nearby and spoke English. Our chat lasted for a few minutes when my interpreter warned me that I should immediately leave her. Alas, we were already surrounded by a crowd and I had to run because the religious police were coming. In 2005, Khatami was replaced by Mahmoud Ahmadinejad, an engineer and teacher and an ideologically conservative hard-liner politician. Ahmadinejad was a particularly controversial figure criticized in the West for his hostility toward Israel, Saudi Arabia and the United States, as well as for his support for Iran’s secret nuclear program. Between 2005 and 2013, there was a hard-liner’s heaven in the Middle East that was, in a sense, a beautiful cohabitation among the hard-liners in the U.S., Israel and Iran. They were the neocons in Washington, the ultra-conservatives in Jerusalem and similar Shiite hawks such as those in the IRCG of Tehran. They hated and fought each other. Most importantly, however, they took advantage of and even helped each other. Without Ahmadinejad in Tehran, the neocon’s policy to topple Iraqi President Saddam Hussein and maintain a military presence in Iraq may not have been justified. But for Ahmadinejad, Israeli Prime Minister Benjamin Netanyahu may not have survived that long. This axis of hard-liners stopped functioning when Hassan Rouhani, another reformist theologian and the holder of a Ph.D. from a British university, was elected the seventh president of Iran. Rouhani was more successful than Khatami in improving relations with the U.S. In 2013, he talked to U.S. President Barack Obama on the phone and finally concluded the JCPOA in 2015. Now you can guess what is happening in the Middle East. With Trump’s appointment of such senior neocons as John Bolton and Mike Pompeo as well as his withdrawal from the JCPOA, Iranian hard-liners are coming back. Rouhani will eventually lose credibility and may not be able to effectively control the IRGC, especially in Syria. If the three amigos resumed taking advantage of and helping each other, the hard-liner’s caravans will be back on the road again. Once this kind of vicious circle gets started, it will take years, if not decades, for the international community to re-establish an effective nuclear non-proliferation regime. Does Trump understand the danger we are headed for? Does he really know this could even lead to a direct military confrontation between Israel and the IRGC in Syria? Never mind, folks! He doesn’t seem to care. What he is interested in seems only how great he looks on TV cameras during the ongoing election campaigns in America.